Big, dumb and full of . . . sun. 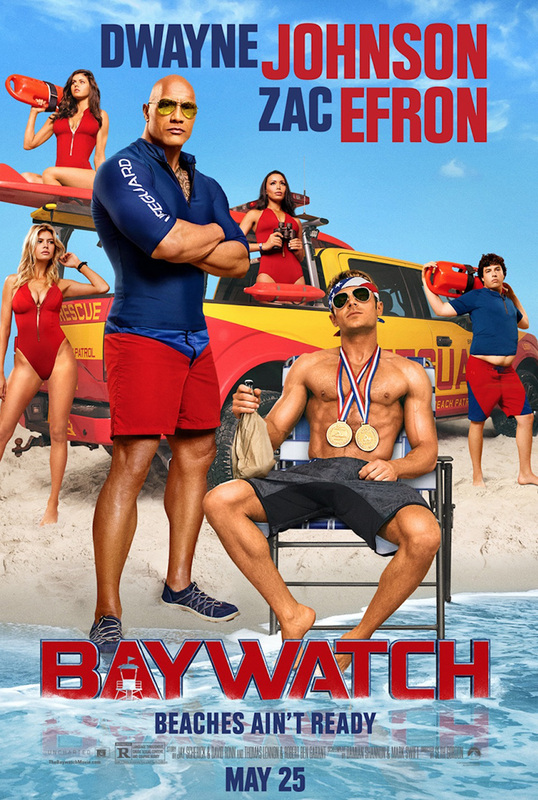 Devoted lifeguard Mitch Buchannon (Dwayne ‘The Rock’ Johnson) butts heads with a brash new recruit (Zac ‘High School Musical’ Efron), as they uncover a criminal plot that threatens the future of the bay. From the director of Horrible Bosses. That should sum up your expectations in a nutshell. A loud, crude BUT (hopefully) entertaining flick. And for a good portion of the running time, Baywatch was. Undeserving of the incredibly low ratings on Metascore. I’ve seen a lot, lot worse. BUT at that same stroke, I’ve seen a lot better. The first 30-40 minutes was everything I hoped for. I don’t think this would have worked without The Rock. He carried the film with his charisma and ridiculous physique. Lapping up the silliness of it all. And almost making it work. A man respected by the community. Doing everything to keep his bay safe while protecting his ‘family’ (the Baywatch team). Corny BUT watchable. Efron played Brody brilliantly. He worked well with the Rock and they made a great duo. The selfish Olympiad bumping heads with the head honcho spiel was predictable but engaging as the pair spewed childish insult after insult at each other. As much as they poked fun at the silly plot line with drug deals and political corruption, it was really dull. When the jokes and banter died down, there wasn’t much else and you really felt the pace; which was a little long at the tooth. Of course, Baywatch was never going to win plaudits for groundbreaking cinema and mind-bending plots. It’s CSI on the beach with lots of beautiful people frolicking around in tight bikinis and shorts. Putting my inadequate body to shame (He says piling in more crisps while writing this review). I was a little disappointed with Alexandra Daddario’s (San Andreas) role. Her naff romance (If you can call it a subplot) with Brody didn’t really work. It was far too cheesy and the banter didn’t come off as well as it could have. Shame. Jon Bass (Big Time in Hollywood) stole the show as Ronnie. The fumbling tech geek aspiring to be a lifeguard. Well, to work with one lifeguard, in particular. And no, it ain’t Mitch. Ronnie’s desperate attempts to woo CJ (Kelly Rohrbach) were hilarious and delivered some of the better laughs. I haven’t really rated Hannibal Buress in the past BUT he was surprisingly funny as Ronnie’s pal. His commentary during Ronnie’s awkward encounters with CJ had me in stitches. The meta-textual references were spot on. You can’t do a Baywatch reboot without the slo-mo. The slo-mo gaffs worked but that joke soon overstayed its welcome. Especially when they started doing SUPER slow-mo. And by the time, a Baywatch icon made her introduction in the closing minutes, I was done. Priyanka Chopra (Quantico) wasn’t in this enough. No. Not just because she looked stunning. A proper femme fatale. Even Big Mitch was on edge. “A Bond villainess? Not yet”. She played the part really well and chewed up the scenes BUT her screen time was reduced to nothing. Only to be brought back in the frantic and rushed finale! It was watchable guff that killed the time. Brody’s deluded theorizing with Mitch’s put downs was fun. The action sequences were well done. The silent punch up in a nursery was fantastic as Mitch took on a henchman. 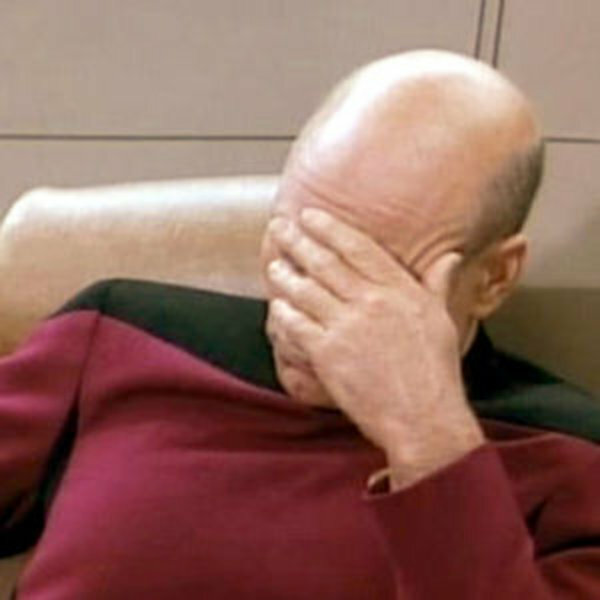 Quietly spewing hushed threats, “You’re going night night b*tch” while slapping each other about with kids’ toys. The morgue investigation was more of what I expected. Crude gags with a dead man’s appendage. Funny one liners and utter mayhem. If anything I wanted more of that silliness and crude humour, the writers played the piece a little too much like a Baywatch episode. I know I’m normally a cynical movie-goer BUT I would have been happy to watch The Rock jump off more burning yachts with insane rings of fire. Even watching Efron dive off a pier while racing a motorbike did the job. The ending seemed rushed and too chaotic. It was as if the writers didn’t know what to do with it. The tone was all over the gaff and The Rock dropped the tough guy bravado for sheer buffoonery. BUT a fun one. Just. 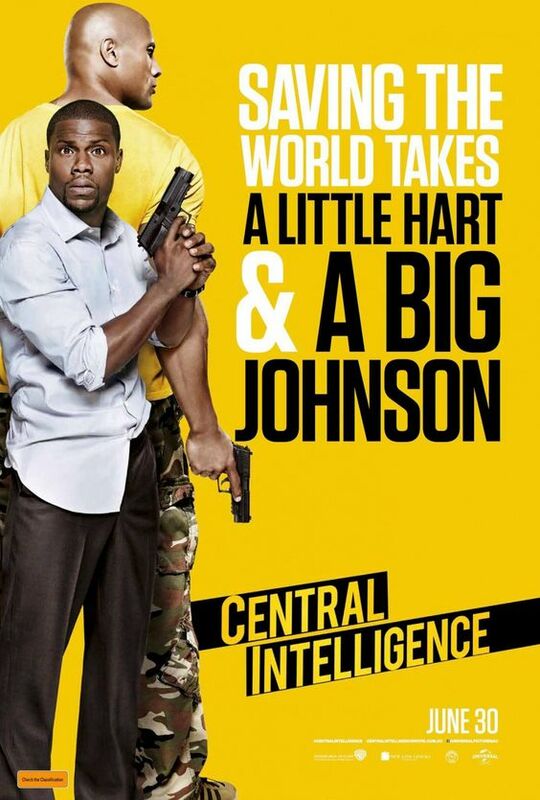 A little Hart + one BIG Johnson = one big dumb fun movie. After reconnecting with an awkward pal (Dwayne ‘The Rock’ Johnson) from high school through Facebook, a mild-mannered accountant (Kevin Hart) is lured into the world of international espionage. I was a little anxious about seeing this movie. Not quite sure whether I was in the mood for another OTT Hart comedy vehicle. The opening didn’t build my hopes up. A naff high school flashback sequence involving a horrifically superimposed Rock on the body of a dancing fat kid didn’t do anything for me. (No, not like that). It wasn’t long before the dancing chubster fell victim to a traumatizing high school prank. The only person to help him; Mr Popular and all round achiever Calvin (Hart). Flash forward back to the present to an older and miserable looking Calvin as he drudges through a mid life crisis, office politics and the joys of accounting. Hart played the straight faced role quite well. And for a moment, the high school reunion and nostalgia subplot could have easily made this a different movie altogether. BUT this was never going to be that kind of movie and once the Brahma Bull came steam-rolling into Calvin’s lacklustre life like a unicorn T-shirt wearing, bumbag carrying tank, I was sold! It made a change to see The Rock playing such a dim wit. Bob uses the high school reunion as a chance to catch up. BUT of course while bonding over a shots and a bar brawl (You read that right), we discover that the simple Samoan needs a favour from Calvin. A favour that throws Calvin’s world into chaos with espionage, carnage and a pretty predictable terrorist plot line. The pair worked really well together and had some cracking one liners. They made a great duo and weren’t afraid to poke at each other. There was also a nice dynamic between them as Bob needs help from the only friend who bothered to help him all those years ago. The action set pieces were brilliantly choreographed and highly comical as Hart’s unintentional fumbling causes more harm than good. To make matters worse, ol’ Bob might not be telling the whole truth. Calvin’s reluctance and numerous escape attempts from the overbearing and resourceful Bob was hilarious. I couldn’t help but laugh at Rocky using Hart as a prop. Chucking him in cars, mail carts and out of windows. Mental. Bob’s obsession with Sixteen Candles (That’s right, the Molly Ringwald movie) was a running gag I didn’t expect. Amy Ryan (Gone Baby Gone) played the uptight generic CIA director as well as she could and the writers tried their best to shroud a little mystery over Bob’s intentions. Deliberately making us question his motives. BUT there was only ever going to be one outcome with the loveable dud-head. The inevitable backstabbing and revelations were tragically too predictable and cut into the zippy pace and laughs, hampering things slightly. I could feel my eyes wandering to my watch. BUT thankfully some crazy cameos from a surprising cast did enough to bring me back into the mix. I could drop names BUT it would spoil half the fun. The finale was frenetic, mad and funny. There were some genuine laugh out loud moments and you can’t go wrong with a bit of blooper reel during the end credits. The story line may have been a little weak and predictable and the pace may have tested in parts BUT it was silly fun and with Hart and Rocky on fine form, I could have think of worst ways to kill the time. Not quite on the same level as 22 Jump Street BUT definitely worth a shout if you’re in the mood for a shoot em up laugh fest. It’s everything you could possibly expect. For some, a nauseating clichéd ridden mess of epic proportions. For others, a special effects extravaganza with The Rock having some B-movie fun. FINALLY! THE ROCK HAS COME BACK . . . TO CALIFORNIA! 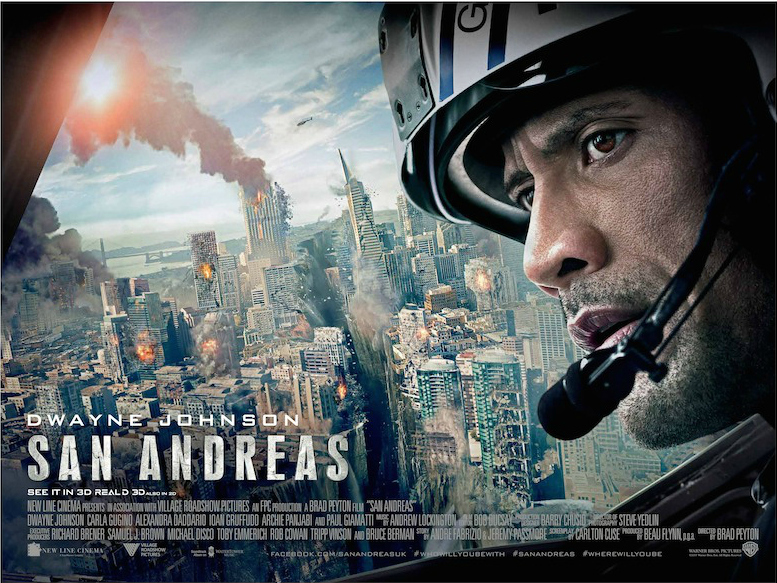 In the aftermath of a massive earthquake in California, a rescue-chopper pilot (Dwayne ‘The Rock’ Johnson) makes a dangerous journey across the state in order to rescue his daughter (Alexandra Daddario). You knew from the opening five minutes what you were getting yourselves into. A big, dumb, incredibly stupid blockbuster. I was in tears of laughter. We watch a young ditzy girl look set to crash head on with oncoming traffic as she drops her cell phone and mindlessly looks everywhere else but at the bloody road. A perfect advertising campaign for DRIVE SAFE if ever there was one. That’s not the funny bit. After narrowly avoiding two cars, her car is swallowed up by the ground after a ferocious seismic wave. But my God! Her car. Boy, it rolled and rolled and rolled. It was like something out of the Animal. Remember that movie? You know the silly Rob Schneider animal comedy? Not sure what I mean. Check out the link. It was just as ridiculous as that. And the girl? Miraculously only has a few scratches and a bit of dirt on her cheek. Hollywood for you. If that little segment made you sigh, then San Andreas is most certainly not for you. It’s very much in the same vein as The Day After Tomorrow and 2012. That means two things; the first being that the special effects will be ground breaking (Pardon the pun) and second . . . Uh . . . Well, it’s got the Rock. I’m sorry but no matter how many times he tries to reinvent himself as Dwayne Johnson; he will always be THE ROCK! BUT I’m getting worried that he will always play this type of character. Don’t get me wrong. The Brahma Bull bossed it. Playing it with the right balance of seriousness as the daring dad. And hey! If you wanted anybody saving you from an earthquake, your money would most definitely be on this jabroni. The special effects were intense. The 3D wasn’t bad. The detail and set design were fantastic. The panning sequence as we watch the plate shift through San Francisco in one giant seismic wave was almost worth the ticket price alone. Almost. BUT then we had to suffer with the same old guff and cliché-ridden characters. The Rock in the middle of a divorce. Paul Giamatti playing the doctor that nobody listens to until it’s inevitably too late. Archie Panjabi playing a pointless news journalist. So many fantastic actors playing terrible and bland character types. I mean it wasn’t that much of a surprise. I knew what I was getting myself into. I just wish it could have surprised me. That’s all. The lovely Alexandra Daddario (Percy Jackson and the Sea of Monsters) did her best as the doomed daughter but you just knew no matter how smart or stupid her actions were; she would still need to be saved by the main hero. Kylie Minogue didn’t do a bad turn as Gugino’s bitchy sister-in-law. To be honest, her character had potential to be a much needed spanner in the works to spice up the dreary exposition. But nah! Ain’t nobody got time fo’ dat. Just a quick cameo for the ageless Aussie. Ioan Gruffudd played the (Put another tick at that disaster movie checklist) douchebag step father well. BUT it’s been done to death. Counting down the minutes until he decides to do something dastardly that will make you shake your head. Not even his inevitable outcome was that adventurous. You could see it coming a mile off. Hugo Johnstone-Burt and Art Parkinson played the nauseating and irritating British brothers. No seriously? Why British? Why were they in it? Just why? They were annoying and stereotypical. Parkinson doing his worst Hugh Grant impression. Bumbling and waffling away. Oh good golly. One needs a stiff cup of tea to get over the excitement. Johnstone-Burt’s dreadful romance with Daddario was as dull as dishwater. The heroic Will Yun Lee was one of the most interesting characters BUT he only lasted 10 minutes. The lovely Carla Gugino had good chemistry with The Rock which made their schmaltzy relationship a lot more enjoyable. A cheeky exchange between her and the former WWF champion got a chuckle out of me. As they parachute to safety landing on a baseball stadium, The Rock simply says, “It’s been a while since I took you to third base”. He might as well have winked at the camera. And Paul Giamatti did everything he could with his doctor role but all his passion couldn’t hide the stupendous theorizing or the fact that his only real sound advice during a mega-earthquake is to hide under a table. A table? Even when vents and air conditioners are dropping down on top of it? COME ON! The pace zipped along surprisingly well and I wasn’t bored. Entertained is another story. It was corny as hell and cliched to the max. It really was everything I expected so I wasn’t disappointed and it did the job. I was able to laugh and switch my brain off for 2 hours! BUT impressed? By the effects. Absolutely. Everything else? Meh. It was a vast improvement from 2012 but I don’t think a film has come close to the legendary nature disaster flick that is Twister! Watchable enough fun. Just don’t expect anything else. Can you smeeeellll what Hollywood is cooking? 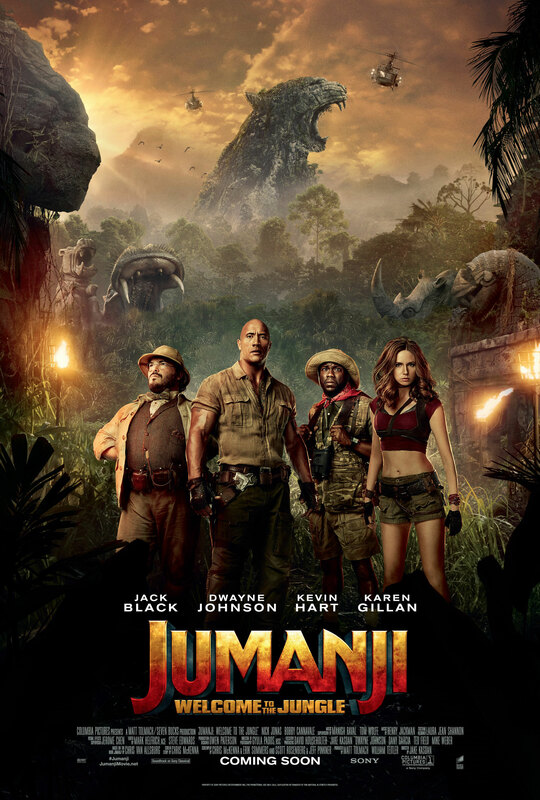 A mediocre action epic of a blockbuster that regurgitates the same old cheesy guff and desperately craves to be so much more but alas it was not to be. Still not a bad way to kill 90-odd minutes, jabroni! Bless my soul, Herc is on the . . . No, enough of that. Wrong Hercules. If there was ever a man to play the ultra-strong demi-God Hercules, it is Dwayne “The Man that is becoming a Rock” Johnson. The man is a machine with enough machismo to inject the wrinklies for more Expendables movies. An absolute tank. Plenty for the ladies and even the fellas . . . if only to sigh at their feeble mortal body flab. On a serious note, Dwayne Johnson is not a bad actor (Hello? He was a wrestler) and always has a charismatic presence on the screen. He has proven to be a reliable lead and it’s great to see him given the platform yet again. However, there are only so many poor lines that The Rock can make sound good. His stone cold stare and asking his foes if he looks afraid, brilliant. His longwinded chivalrous speeches about becoming the legends you were born to be, meh not so much. Brett Ratner (Rush Hour) has never been one for story and drama. His strengths have always been action and bringing the laughs. Now when the action does kick in, it’s pretty decent. The CGI actually helps make the scenes. The 3D was actually very impressive, if gimmicky. I mean a flaming arrow flying at you out of the screen is always going to be gimmicky but cool. (I know. Lame so sue me). The animated adversaries that Hercules must fight are brilliant visual sequences as well as the battle scenes. That along with Hercules’ rag tag team of misfits makes this an easy going, silly but watchable movie like the movies of old. However, it is when the team disperse and Ratner has to tell a story to piece all the wonderful animation and good action together that it drags the film down and puts you into a lull. I know? Even at 98 minutes. Even with a decent cast, you can’t help but laugh or tut at the predictable and lazy guff. It’s so corny and dull, you find it hard to keep an interest. I mean after all the promise of the opening with Hercules’ team fighting while delivering cheesy banter, I actually wanted more of that during the “serious getting to know the characters and trying to add dimensions to them” segments. 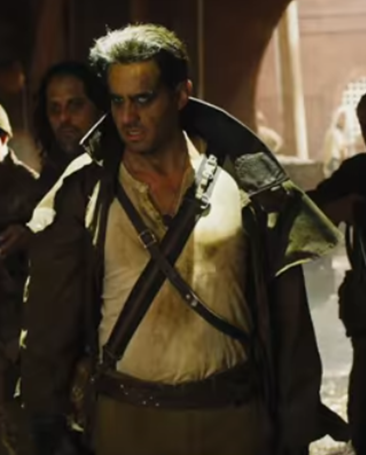 Joseph Fiennes plays a restricted if perfectly type cast role as the sleazy King Eurystheus. John Hurt does his best to try and apply some acting gravitas to his frail malicious Lord Cotys (no, not Coitus! Stop it!). Peter Mullan is to be expected as the shady Sitacles. It’s great to see him getting in bigger movies. A great actor. Rufus Sewell and Ian McShane were certainly the most memorable out of the misfits. Sewell is an underrated actor and it’s nice to see him play a good guy for once. He manages to come out with some of the better one liners. Ian McShane is pretty much playing himself but as a wizard who can see his own death. However, the rest of the cast are either flat or really irritating. Reece Ritchie and Rebecca Ferguson (no, not the X Factor singer!) I’m looking at you. Ritchie’s OTT narrator was awful. Sorry, only Paul Bettany got away with that in A Knight’s Tale. To be honest, it has fun moments but it gets dragged down by its own lazy attempts to try and be serious. It’s big and dumb. Don’t try and be clever. While I was watching the Rock dispense enemies with a fist here and a mighty swipe with his club there, I really wanted more. I mean, not even a Rock Bottom or an Elbow of his people? Apart from punching a guy off his horse and one 50 yards across the field, there isn’t much else. 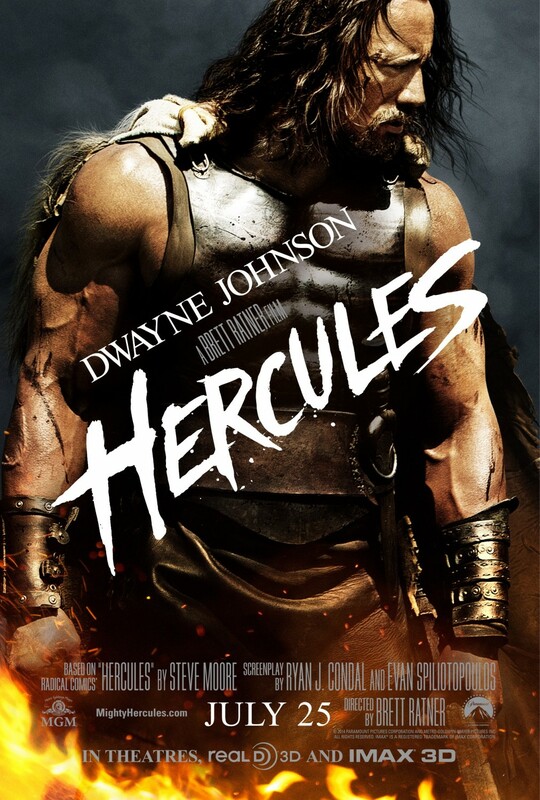 The idea of playing down Hercules as a demi-God and that he is a fraud, exaggerating stories to bring fear to his captives for his bounty is a good concept. But when you see him punch guys across the battlefield and fight giant lions, you’re not fooling anyone. I mean, look at him? It also made me want to watch The Scorpion King again. A film that by comparison knew it was being big and dumb and was better for it. It’s okay. At it’s best, action packed and cheesy. At it’s worst, dull, boring and cheesy. Worth a watch if you want a no-nonsense punch up blockbuster but otherwise, invest in Gladiator or The Scorpion King! 2.5/5 for me. Next time, Mr. Ratner better banter, better baddy and a bit more fun. Screw the story. Do I look afraid? Please find my Hercules related videos just to make a change.